As the last album featuring ELOY's "golden" line-up, "Silent Cries And Mighty Echoes" marks the end of an era. After the success of "Ocean", this new opus was their best selling record. Musically, the style is the same as on the previous opus, however a little more space-rock and science-fiction oriented. Catchy melodies, variations, rhythm changes, spacey guitar soli, synthesizer layers, hypnotic bass... Everything you're looking for is present. The only small problem is that the band was accused of plagiarism. The compositions exhibit clear inspirations from their British elder brothers, PINK FLOYD. So, rip-off or not rip-off? "Astral Entrance" certainly resembles the famous "Shine On You Crazy Diamond Part 1" ambient opening with its synth-textures and Gilmour-ish guitar. It may have been first time this introduction was ripped-off, but clearly not the last in the progressive world. However, "Master Of Sensation" is different. This catchy song is an immediate boarding for space travel adventure, with varying rhythms and cool Bornemann soli. It really rocks! The 15 minutes "The Apocalypse" epic is the highlight of the record. A cosmic odyssey, alternating aerial and oppressive atmospheres.Driven by synthesizers and bass, this piece contains two PINK FLOYD references. The first one is the female singing passage in the style of "The Great Gig in the Sky". The second one is the pulsating bass line of the ending part, similar to the bass loop on "Echoes Part 2", however with a heavy guitar riff finale. Needless to say these two tracks are amongst ELOY's bests. That's it for the FLOYD's borrowings. We continue our interstellar journey with the energetic "Pilot To Paradise", a dynamic song carried by a nice synthesizer melody with some symphonic incursions. The two last tracks are much more ambient and slower. "De Labore Solis" is the weakest track of the record, as it is a little repetitive and does not contain many changes. On the contrary, "Mighty Echoes" offers much more variety and possesses a mystical ambiance. It features a pretty glockenspiel melody, a cool bass line and a spacey finale. The remastered edition features 2 bonus tracks. If "Child Migration" (different from the track of the same name in "Colours") has replaced "De Labore Solis", this album could have reached the maximal note. This song is one of ELOY's catchiest and rock-iest! "Let the Sun Rise in my Brain" is more anecdotal. So, plagiarism or not? "Wish You Were Here"'s little brother? I wouldn't say so. First, the borrowings are only present on some parts of the first two tracks. Second, and the most important, ELOY uses their floydian inspirations to develop a different music with its own style and personality: a mixture of fantasy, symphonic and sci-fi progressive rock. 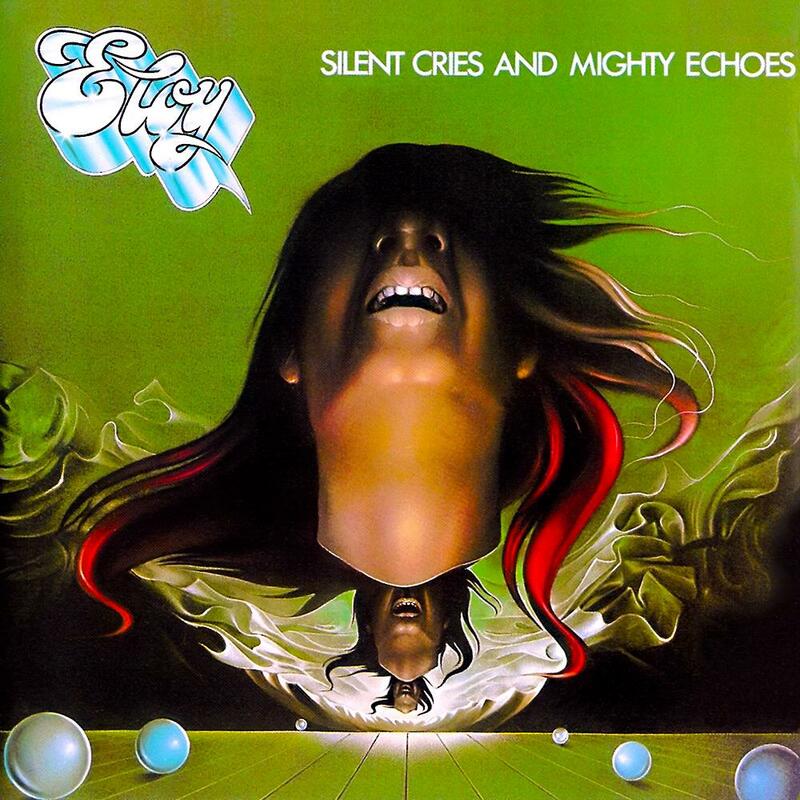 Whether "Ocean" or "Silent Cries And Mighty Echoes" is the best ELOY's album is just a matter of taste. If we really want to sum up, the blue one is more symphonic, while the green one is more space-rock oriented. As you prefer. Personally, even after numerous listens over years, I still can't decide. Anyway, although arriving 4 years too late and sounding a bit dated, this opus is certainly one of the best progressive surprise of the year 1979. An essential record for space-rock and PINK FLOYD lovers!